Heat the oil in a large pot or rondeau over medium heat. Add the onions and saute until translucent, 4 to 5 minutes. Add the garlic and saute until soft, about 1 minute. Turn the heat to medium-low. Add the tomato paste and cook until it completely coats the onions and develops a deeper color, 1 to 2 minutes. 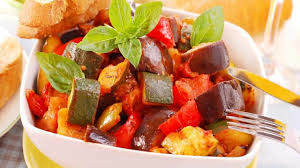 Add the vegetables in the following sequence: peppers, eggplant, zucchini, and tomatoes. Cook each vegetable until it softens (2 to 3 minutes each) before adding the next. Add the stock and turn the heat to low, allowing the vegetables to stew. (The vegetables should be moist but not soupy.) Stew until the vegetables are tender and flavorful. Season with salt, pepper, and herbs.